An important part of Von Neumann's stored program architecture is the memory, because that is where not only the program is stored, but also where the data that the program works on, and any temporary results are stored. 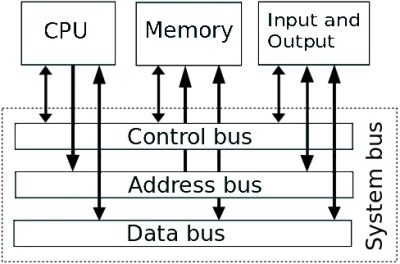 Although a computer uses all kinds of memory for various functions, the memory where the program can be executed and the data is manipulated is called "main memory". Every program being executed and every piece of data being manipulated must be copied from a storage device, such as a magnetic disk, into main memory. The amount and speed of main memory is possibly the most important factor in determining the power of a computer. It's important to understand the basic types of memory. When computer data is "backed up" it is usually backed up to a tape drive. A tape drive represents "serial" or "sequential" memory. With serial memory, data is accessed sequentially. This has the disadvantage that access time depends on the location of the desired data on the serial storage device. Random Access Memory (RAM) is a type of memory where any byte of memory can be accessed randomly, without examining the preceding bytes. The term RAM is also used to distinguish read⁄write memory from Read Only Memory (ROM) which is unfortunate because ROM is also accessed randomly. Whereas you can read and write data to RAM any number of times, you can write to ROM only one time. After that you can only read from the ROM memory. The term ROM is also used to distinguish non-volatile memory from volatile memory. With volatile memory, when the computer power is lost, so is the data in the RAM. However, with ROM, data is not lost when the computer power is lost. ROM is important because it contains the basic programming and data that allows your computer to be "booted up" or restarted each time you turn it on. If you're not confused enough about the different types of memory, there are also various types of "electrically alterable" ROM memory. These devices normally work like a ROM, that is read only, but with the proper control signals they can be re-written. Most of the time these are referred to as EPROM (Erasable Programmable ROM), but they can also be called EAROM, EEPROM, E^2PROM, and may other contractions. RAM can also be divided into "static" and "dynamic" types. You might think dynamic RAM (DRAM) must be far superior to static RAM (SRAM), but no. DRAM is used for the computers main memory because it's cheap to manufacture. However, like everything in life, there are always trade-offs. The trade-off with DRAM is that it quickly loses its contents. It must be constantly "refreshed", and this requires complicated circuitry. A capacitor consists of two conductor plates which are very close to each other, but have a dielectric insulator between them. 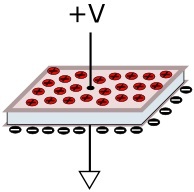 When you apply an electric charge across a capacitor, electrons can't flow through the insulator, so they build up on the plate connected to the negative voltage source. Although electrons can't flow through the insulator, an electrostatic charge can pass through the insulator, thus repelling electrons on the opposite plate, causing it to gain a positive charge. If you apply a positive electric voltage to a capacitor, and then remove its continuity to the circuit, it will retain the voltage. Obviously, if the voltage is equal to the level defined as binary 1, you have stored a binary bit. If you restore the continuity with zero volts, the capacitor will discharge. If you then remove its continuity, you have stored a binary 0. This is how a binary bit is stored in DRAM.